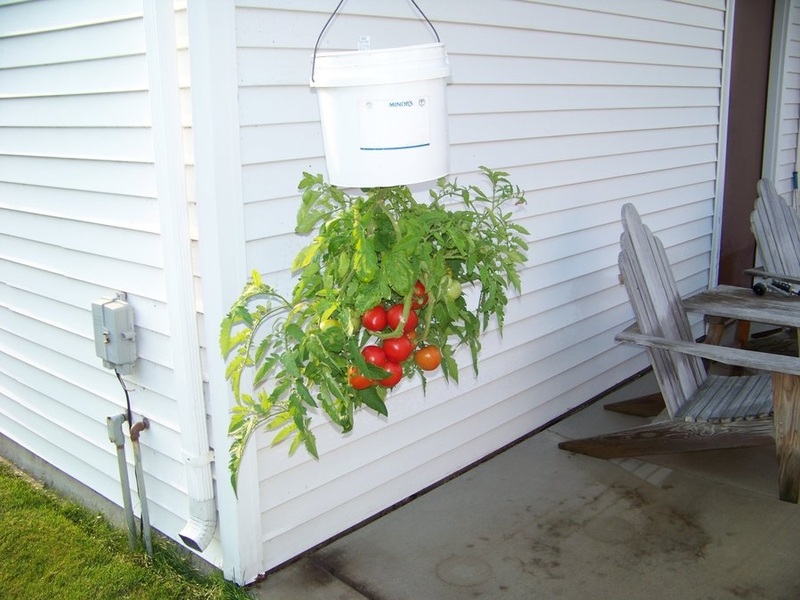 With the proper technique, a right side up tomato plant, for example, can be grown a new way ... upside down ... and produce the same type of yield as right side up (photo). This principle can also be applied by an emerging composer to the production of another Fugue from a previously used Fugue subject. Some of the scores posted on this web site demonstrate how a subject worked in one Fugue (Op. 25) can be inverted and employed as the subject in a second Fugue (Op. 26). It can also be demonstrated that a subject from a previously composed Fugue (Op. 27) can be inverted and employed as a countersubject in another Fugue (Op. 28). If an emerging composer hasn't yet tried to do something like this in their compositional work, the opportunity is beckoning them. In the Fugue from the D Major Op. 28 Prelude and Fugue the subject is inverted and employed not just as a countersubject but as the 1st of 3 countersubjects which are maintained throughout, in quadruple counterpoint [See blog, Inversions]. When multiple countersubjects participate in a Fugue like this, the counterpoint becomes thrillingly dense, and even more miraculous sounding when all voices are clear, independent, and mutually complimentary. Historically, coordinating this complexity so that the final unity is aesthetically successful, for composer or performer, has been an achievement of high art. The paired Op. 28 Prelude, in its turn, might also be constructed upon a single theme in Vierne's 6-part improvisational form and in some manner previously untried by the composer, such as by using the Fugue's 3rd countersubject for a theme. This idea is not new; as early as Dutch composer Jan Pieterszoon Sweelinck (1542-1621), the so-called "father of German organists" whose work straddles the Renaissance and early Baroque periods, we find a composer who loved to take secondary countersubjects and use them fugally in his Fantasias. In the exposition of this Fugue the subject, which begins on the 1st scale degree, enters in the tenor and is supplied with a real answer in the dominant in the alto on the 5th scale degree, as expected; here the (1st) countersubject in the tenor line is the inverted subject from the F Major Op. 27 Fugue. After 2 additional bars of codetta which allows a smooth return to the home key the subject then makes its 3rd entry in the soprano as the alto carries the 1st countersubject and the tenor the 2nd countersubject, in order. The 4th entry has the subject in the dominant again, this time in the bass with the 1st countersubject (1CS) in the soprano, the 2nd countersubject (2CS) in the alto, and an additional counterpoint in the tenor which, as the Fugue progresses, is maintained throughout and thus becomes a 3rd countersubject (3CS). Modulating episodes of 4 bars each, based upon snippets of the subject and countersubjects, separate the various entries throughout the course of this Fugue. The 2nd entry finds the music in the relative key (b minor) where the subject enters in the tenor, the 1CS in the bass, the 2CS in the alto, and the 3CS in the soprano. The 3rd entry is in the dominant key (A Major) and has the subject in the soprano, the 1CS in the tenor, the 2CS in the bass, and the 3CS in the alto. The 4th entry modules to f# minor where the subject enters in the bass, the 1CS in the tenor, the 2CS in the soprano, and the 3CS in the alto. For the 5th entry we find the music in the unrelated key of a minor with the subject entering in the alto, the 1CS in the bass, the 2CS in the soprano, and the 3CS in the tenor. The music then makes a turn into G Major where the subject enters in the soprano, the 1CS in the alto, the 2CS in the tenor, and the 3CS in the bass. The 7th entry has the music in e minor where we find the subject entering in the tenor, the 1CS in the alto, the 2nd CS in the bass, and the 3CS in the soprano. For the 8th and final entry the music returns to the home key (D Major) where, following many examples left to us by J.S. Bach, the final entry of the subject is in the bass, in the lowest octave of the pedals, with the 1CS in the alto, the 2CS in the tenor, and the 3CS up high in the soprano, paying homage to its place as the theme of the Prelude. A coda of 8 bars follows during which imitations of the head of the subject are heard in the top three lines over a dominant pedal point; the music finishes in 8 voices with a tonic chord reiterated 3 times with an added 6th under an inverted pedal point in the top line. The paired Prelude uses the Fugue's 3rd countersubect for a free theme and is worked in the 6-part improvisational form favored by Louis Vierne. After a 2 bar introduction this 3rd countersubject, or theme, which is extended from 5 to 7 bars, is harmonized diatonically; a 6 bar bridge section then modulates to the dominant key (A Major). The 2nd exposition consists of a 3 part canon at the octave at a distance of a quarter bar, beginning in the soprano followed by the tenor and then the bass; a 4th free voice in the alto fills in a 4 part texture and utilizes mostly "sweet" intervals of 3rd and 6ths which helps keep the imitations clearly audible. Here the 2nd exposition becomes a variation where the outline of the theme is adjusted slightly to stir the sands of monotony; this also helps in a technical way to eliminate any glaring dissonances or parallel octaves. The development based upon a one bar fragment of the theme takes the music into the relative key (b minor) and then quickly through e minor, a minor, A Major, d minor, D Major, g minor, c minor, and f minor before landing in Ab Major, way over on the other side of the Circle. From there the music, by means of a sequence, modulates to d minor where the fragment is heard again, once more in a 3 part canon at the octave at the distance of a quarter bar beginning in the soprano, then the tenor and finally the bass. After this canon the music comes to a stop on a C7 chord; a 4 bar preparation for the reentry brings about a return to the home key for the final entry. During this reentry the theme appears again in the top line, this time taking on the nature of another variation by being harmonized with chromatic planing in the manner of Vierne. The Prelude then closes quietly on a spread D Major chord in 8 voices with an added 2nd. This piece, along with the a minor, b minor, and F Major Preludes & Fugues (Op. 25-27) which precede it, due to the process involved in pairing each Fugue with its Prelude, may represent a new synthesis in the written organ repertoire [See menu bar, Free Stuff, 5 Preludes & Fugues, Suggestions for Performance].